When choosing a topic to base my magazine on, I immediately looked at areas I am interested in such as technology and travel. We had a feedback session with our tutors to show them references and ideas we were working on and I had 2 ideas for magazines. My first concept was for a travel magazine that highlighted 'wow' locations and evoked a hunger for travel. I love traveling and this magazine would show readers exciting locations and teach them about different places without trying to sell them holidays. My tutors didn't like this idea due to the limited market and lack of a strong USP. My second idea was for a technology and innovation magazine, aimed at professionals in the technology industry and people with an interest in the area. They preferred this fresher concept and looking back it was defiantly more interesting to me. Now that I had a rough idea for what my magazine would be, I redefined down my ideas to create a clear concept that I could build on. I made a document explaining the target audience, the visual style, possible sections and more concentrated topics to look at. Although this was not required, it really helped me focus in on my idea and helped me see exactly what I needed to do. For a film project we had to create a treatment document that explained the film in detail and we constantly referred back to the document to check we were on the right track. This document for my magazine was very similar in that I could keep referring back to it and check I was still working in the right direction. At the start of the project I had a lot of thoughts in my mind about different ideas and it was getting confusing, so this treatment style document helped me focus down and allowed me to work with clear intention. 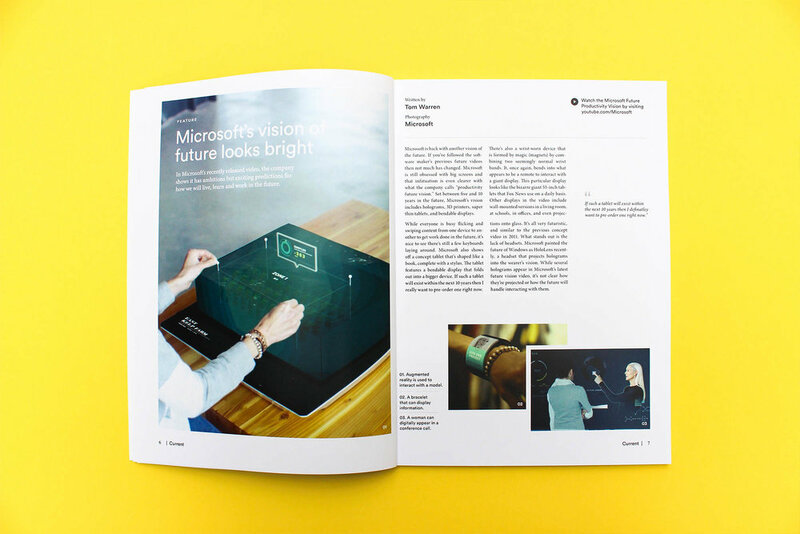 I decided that my magazine would focus on lifestyle innovation, business technology and design ideas allowing for a varied mix of connected fields. I looked at magazines such as Monocle, Wired and Wallpaper which had a similar target market. I really broke apart the layouts in these magazines to look at what grid systems they were all using. I gathered content to use but started to design layout spreads that looked awful. I was putting too much content on each page which was creating a messy and confused design. There was too much to look at and elements were fighting for attention. I had also designed some article spreads but they lacked character and personality. Everything looked a bit flat with no real consistency in design language. At this early stage in the project I was really struggling to create interesting work. I took a few days off and decided to start again in a new document. I also talked with Liz, one of the print technicians who gave me a stronger understanding of the print and binding process of magazines. After talking to her I decided to make my magazine 210x280mm which is the same with as A4, but a bit shorter, creating a more bespoke layout. In the new document I created a 6 column grid with 12 horizontal guides. This really helped me create balanced pages that flowed together. In the previous document I tried a few different grids such as 5 columns, 7 columns and different margin sizes but nothing looked good enough; however this experimention allowed me to make smarter decisions the second time around. On my new document I knew exactly how big to make the margins and the 6 columns grid worked really well for my layout. when adding content to pages I tried to keep things clean and structured but not overly minimal. I paid attention to white space and the effect it has on spreads. I also tried to be more interesting with type in my headlines, varying point sizes and having some text rotated so it displayed up the side of pages. I used the Circular Type family for page headings as it's a clean Sans Serif font but it still has a bit of character to it. I used Minion in all caps for subheadings and used a varied mix of both Circualr and Minion for body copy. Throughout this project I learnt a lot about font paring between serifs and sans serifs. I was really happy with the outcome and felt the type looked clean and modern, but still sophisticated and credible. Staying true to the 6 column grid I used large photography to try and make spreads engaging. To accompany articles I included pull quotes, facts, maps and subheadings to add more interesting elements to pages. I knew that I wanted to keep every article to just 1 spread, so readers will stay engaged and can see a lot of content fairly quickly. I also tried to take as much of my own photography as possible so for many pages I carried out photoshoots for both people and products. 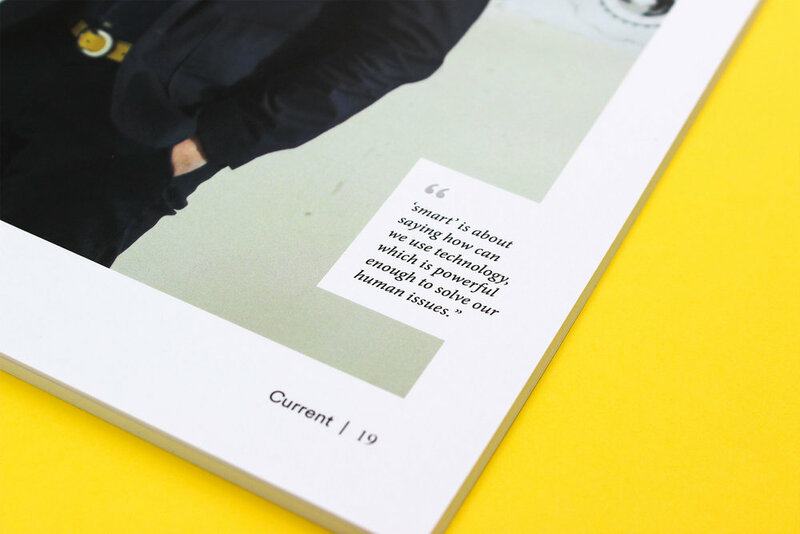 The name 'Current' came towards the end of the project after most of the magazine had been designed. 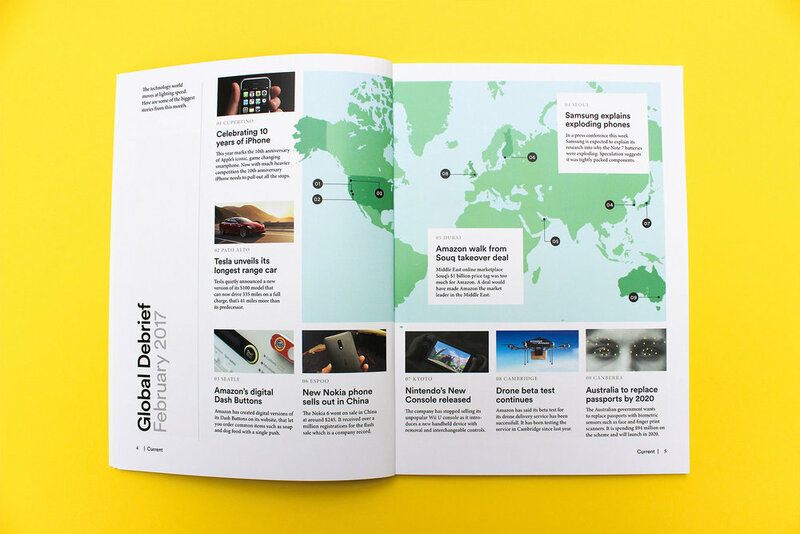 I felt it sums up the magazine nicely as it shows current design, business technology and innovation. There is also the pun of 'electrical current' being appropriate for a technology based magazine. In final feedback with tutors before print, they were really happy with my progress and liked the spreads. I was really pleased with how the magazine came out and it looked much better than I expected. 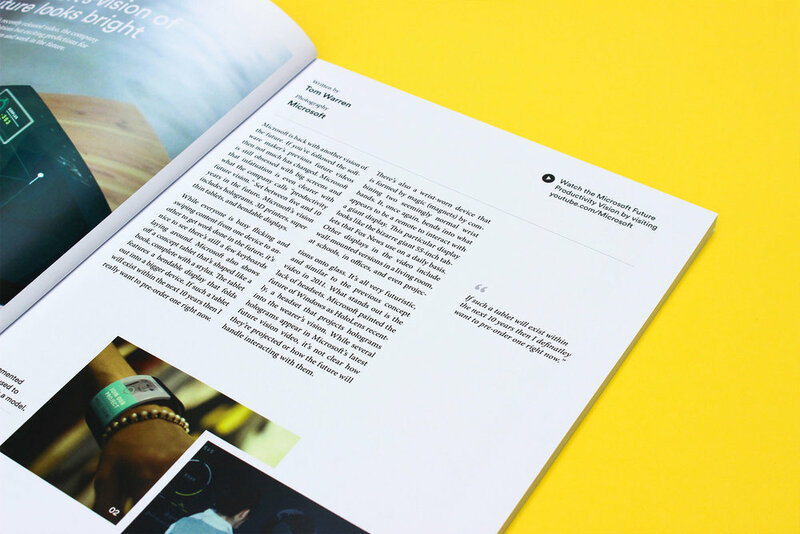 This project has taught me so much about both layout design for print and the design process in genreral. Towards the start I was really struggling and it took experimentation to find a style that worked for me. It was during that experimentation that I really learnt a lot about layout design, grids, font pairing and how to refine all of the small details. This meant the second time around I had a much clearer idea of what to do. It has taught me that if I have designers block I need to take a break, keep experimenting, talk to people and keep trying new things out. I really enjoyed seeing my finished outcome printed and bound as a tangible object, the process was one of the hardest design tasks I've carried out but it was definitely worth it in the end.